"Aren't we all the same? Waiting for something, for someone from the past, bringing back happiness." H�l�ne Angel's freshman directorial effort is an odd, nearly unclassifiable film, which mixes elements from fairy tales, horror films, and childhood dramas into a unique and unpredictable mix. It's the tale of the Pujol family and the events that transpired one summer, as 13-year-old Christelle (Virginie Guinand) and her younger sister Aur�lie (Cathy Hinderchied) spend time at their grandmother's (Maa�ke Jansen) home in the south of France. Their policeman father Frankie's (Serge Riaboukine) vicious behavior has resulted in an involuntary "vacation," so he joins them and his younger brother Alex (Pascal Cervo). But there's another guest: Alex and Frankie's brother Coco (Bernard Blancan), who disappeared 15 years ago, shows up unexpectedly and shatter's the family's bucolic summer. After some initial discord, Coco is accepted warmly by most of his family and friends, but it's not long before suspicions arise about his explanation of his missing years, supposedly in the French Foreign Legion. He's skinny and frail, and doesn't know the songs that a Legionnaire would be expected to have memorized. He's also desperately afraid of women, and his encounters with Christelle (who has frightening dreams about him) and Aur�lie are uncomfortable and forced. Coco's actions become increasingly bizarre, and it's readily apparent that it won't take much to send him over the edge. But Coco's not the only brother with a problem. Frankie's womanizing and erratic behavior have not only caused his wife to leave him, but also his forced absence from the police force. He's not that that far removed from Coco in either comportment or disposition, and Riaboukine's pock-marked face and unruly hair emphasize his potentially threatening demeanor. Even the fresh-faced Alex, at first glance innocent and unspoiled, has a darker side. He's involved in some shady transactions, and when his boss gives him a BMW, his simple reply is, "I'll do anything you want." In fact, all of the men in Angel's film are portrayed negatively, with hearts of beasts. The women, on the other hand, fare quite well. Grandma Marthe is portrayed as loving and caring, concerned with the welfare of her children and the family as a whole, and the two girls are both seen as innocents, despite Christelle's adolescent hostility. It's only in the person of the slutty Annie (Guilane Londez), who is pursued by (and pursues) most of the male characters, that some equilibrium in reached in what might other be seen as a rather unbalanced film. With her protagonists and their flawed personalities as background, director Angel mixes in elements drawn from fairy tales. Christelle has a disturbing dream about Coco devouring herself and her sister � la Hansel and Gretel, and Coco himself is the long-lost son from many a story. There are monsters in the woods, a secret passage to the basement, and even a magic mountain, and Aur�lie herself appears in a fairy costume. It's fascinating to watch how the plot both contrasts and reinforces these fantastic elements with the real-life horrors present on the screen. 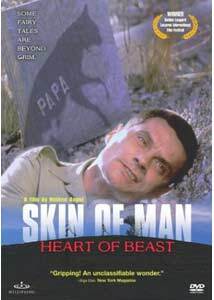 But it's not just the complexity of the plot and thematic elements that make Skin of Man Heart of Beast so interesting. While the plot resolves to a satisfying conclusion, Angel withholds a complete explanation of events and motivation. Coco is obsessed with a remembered "Ronnie," whose identity is never explained, and indeed, we never quite understand the events in his past that would lead him to his murderous outbursts. And there are elements of Alex's life�such as his unexplained delivery of a girl, her legs handcuffed together, to parties unknown�that remain mysterious, and this refusal to tie up all of the loose ends contributes to the sense of unease and unpredictability of the film. Angel's visual style reinforces what is already a disturbing film, with frequent shots that are framed slightly off balance, and documentary-like camerawork that doesn't always privilege the main characters. The performances are good, especially Serge Riaboukine as the bear-like Frankie, and Cathy Hinderchied is charming as the five-year-old Aur�lie. Other than the jarring last five minutes, this is a fascinating and effective film, unpredictable and complex, and well worth a viewing or two. Image Transfer Review: The transfer is rather disappointing. Although it's anamorphic, the image is soft and lacking in detail. Colors are unnatural, and this is especially evident in the skin tones, which tend towards orange. The most obvious flaw is the lack of gradation in darker portions of the image, which is especially distracting in the many night scenes. Extras Review: The original theatrical trailer is presented in a 1.85 nonanamorphic transfer from a source that is riddled with flaws, and its faded color makes it even less appealing. The other trailers, most of them in nonanamorphic widescreen, provide an interesting glimpse into other Wellspring and Fox Lorber releases. But don't be fooled by the trailer for Yi Yi, as the DVD contains one of the most execrable transfers ever unleashed on an unsuspecting public. In Skin of Man Heart of Beast, director and co-writer H�l�ne Angel creates an unusually creepy mix of fairy tale themes and all-too-real violence. The transfer is nothing to write home about, but the movie itself is reward enough.